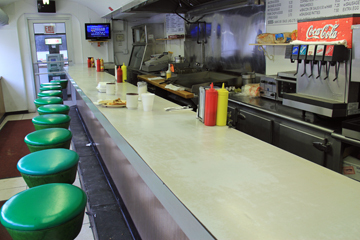 Take a tour of our area's oldest diners by clicking the photo. Turn up the volume, too! Our question asker Rachel Kimura enjoying some diner fare. The waffle combo meal from Chicago's Cozy Corner Restaurant. Kaya toast with soft cooked eggs, and coffee in Singapore. 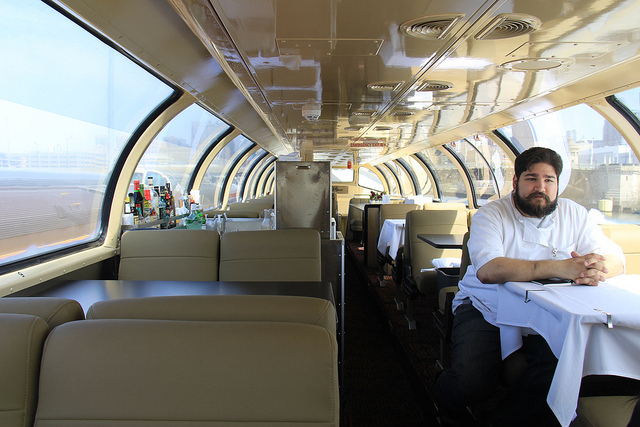 Chef Daniel Traynor sits aboard a refurbished Pullman car before setting off to New Orleans. The expanded Franks Diner in Kenosha. Built in the 1920s to look like a train car, but never intended for the rails. The vintage wrap-around counter inside Moon's Sandwich Shop on the West Side. A quiet morning at the Diner Grill on Chicago's North Side. The building used to be an operational train car. The signature "deuces wild" from the now close Ohio House diner in downtown Chicago. The Slinger. The Jumpball. The Garbage Plate. The Deuces Wild RIP. 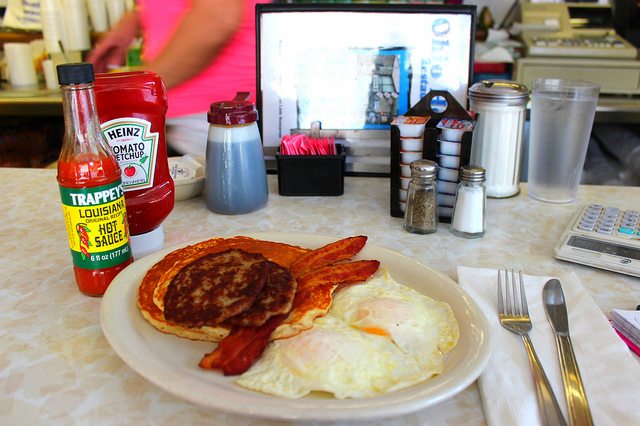 "Where are the area&apos;s oldest diners and what are their stories?" Rachel elaborated: "I love going to diners where it is evident that the waitresses and cooks have been around forever and probably have many stories to tell. I love that diners are a place where families, blue-collar workers, elderly couples, and hung-over twenty somethings can eat together." Me too, Rachel. When Curious City creator and producer Jennifer Brandel asked if I’d investigate the question, I said (paraphrasing), Heck yeah. OK, so back to Rachel’s question(s): Old? Check. Thanks to domu’s terrific list of vintage Chicago restaurants. But how do we define a diner? As I wrote previously, our friends at Chicagoist happened to have listed their favorite diners recently. With all due respect, not all their favorites are diners — at least not in my book. After a Waffle Combo Meal with two eggs over easy, ham, hash browns and coffee at Cozy Corner Restaurant and Pancake House in Chicago (the Kelvyn Park location, not the 1977 original Logan Square location) I came to a decision. How will we define a diner? But first, I had to go off to Asia for work, which actually helped further define our diner parameters. In Shanghai, I went on a futile search for the Four Heavenly Kings: dabing (Chinese pancake), youtiao (Chinese fry bread), steamed sticky rice ball and soy milk. This was once the most common breakfast order on land first settled in the 5th century, in the most populous city in the world. But, I was told repeatedly, it’s old fashioned street food that they didn’t have. Would I like tea or caffè latte instead? In Singapore I made my way to the original 1919 location of Killiney Kopitiam, the oldest coffee shop in the Southeast Asian city-state-island country. 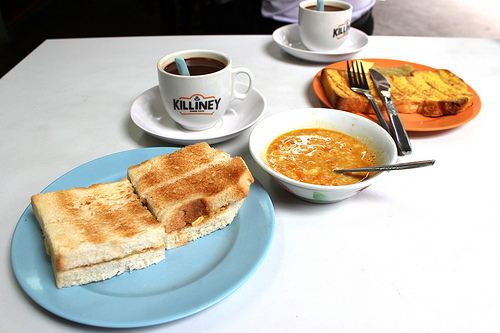 Their specialty is a thick crust version of the national breakfast: kaya toast with soft cooked eggs, and coffee. So after a global diner race against a ticking clock, I further refined our diner parameters: They would be diners on an endangered species list. And perhaps they could represent us on the UNESCO intangible cultural heritage list. Some are more “endangered” than others, and one is, in fact, extinct. 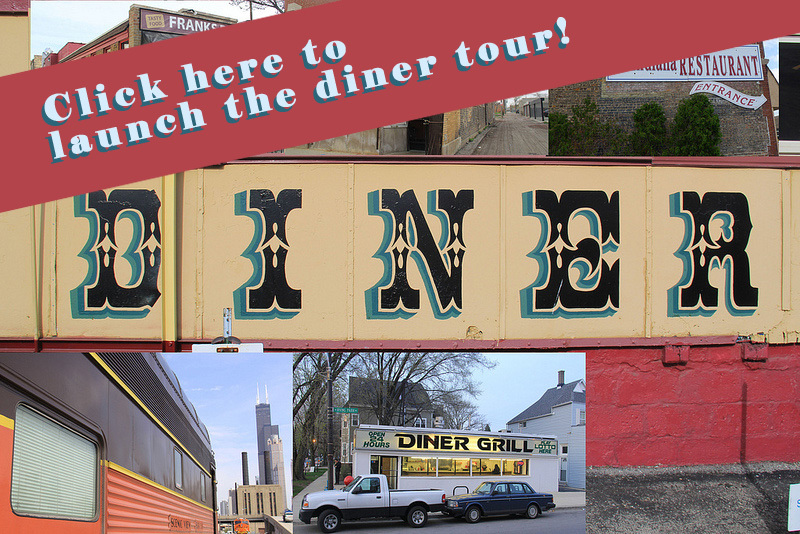 But before we tell some of the stories of the area’s oldest diners, we need to visit the origin story. Luckily history had pulled into the station. At Chicago’s Amtrak yard we visited some of the original Pullman train cars, which date between the ‘20s and ‘50s. There, we spoke with executive chef Daniel Traynor and head steward Jason Makor as they prepared to depart for New Orleans. George Pullman established his eponymous company in 1862. Traynor has researched Pullman culinary history and explained that every line had a signature French toast. Pullman bread, the dense, crumbed white bread still baked in a lidded metal pan, was invented to fit in tight train galleys. Makor to this day recreates the meticulous table settings; in particular, he uses doilies for every compartmentalized dish, as Pullman himself dictated until his death in 1897. Traynor explained that dining cars once connected farmers, local food producers, diners, and chefs. These dining cars also contributed to a long-term trend; the cars were self-contained, meaning they could operate as free-standing restaurants. So when dining cars went out of commission, some became the diners we know today. Husband and wife owners Julie Rittmiller and Kevin Ervin clarified a common misconception about Franks: It is not, in fact, a repurposed railroad diner car. In 1926 Greek immigrant Anthony Franks bought the brand new restaurant from Jerry O&apos;Mahony Inc., "Lunch Car Builders," in Bayonne, N.J. It was shipped on rail flat car (hence its design), and it was filled with dishware and flatware, too. Julie showed us the original bread box which will be refurbished and displayed. She said the diner is haunted by an unknown female ghost who — late one night — blew open a storeroom door. This, it turned out, was helpful, mostly because Julie’s hands happened to be full at the time. Franks special: the Garbage Plate. Let’s address the elephant in the room. Moon’s opened in 1933 and was named for its former moonshiner owners. 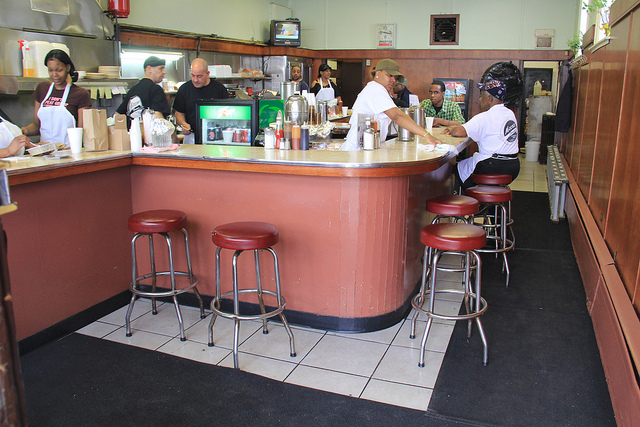 In its current building since 1947, you may notice most everyone in the room — in front of the counter, as well as behind it — is African-American. Except perhaps for a few longtime regulars and owner Jim Radek, who’s a cross between Bruce Willis and Al Pacino. Radek, a former regular due to his work as a neighborhood police officer, told us the harrowing tale of one rough day. Nearly two dozen locals chased a guy into Moon’s, or rather to its threshold. Radek told them they couldn’t continue the pursuit because Moon’s was a sanctuary. Like church. And so it was and remains to this day. Moon’s special: the Jumpball. Open 24 hours a day since 1937 (“March 15 8AM,” to be precise, according to the original framed black and white photo behind the counter). Managers Ricardo Hernandez (days) and Kenny Coster (nights) have been working the grill for 12 and 11 years, respectively. 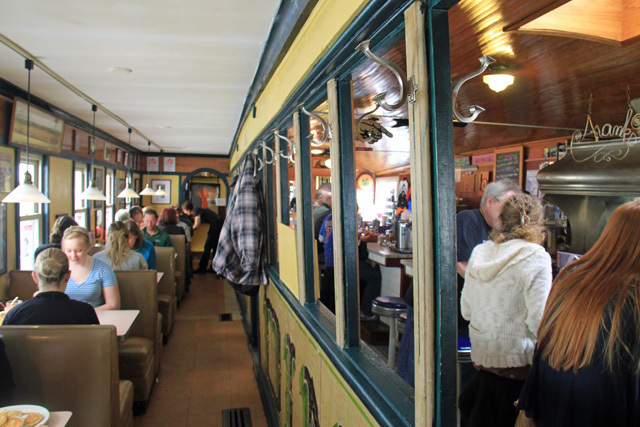 The restaurant is an old trolley car and sits at the end of its former trolley line. The busiest hours are between 3 a.m. and 6 a.m. Ricardo once worked the night shift himself and says he doesn’t know how Kenny still does it. Kenny says he’s had to talk would-be pole dancers down during their night of revelry. While passing out is not encouraged, they do let diners sleep it off, presumably if they can stay perched on the stools. Diner Grill’s special: the Slinger. While the coffee shop dated back 53 years, owner Cathy Roquemore was there about 30. Cathy served the last Deuces Wild on Sunday, April 28, 2013. After more than three decades behind the counter, she was given 30 days to vacate. 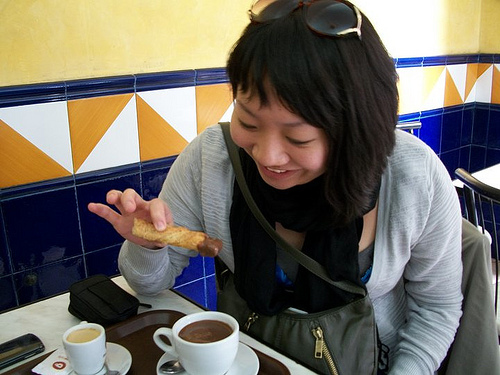 Cathy started out as an employee — the only employee, actually. The former owner, a drinking buddy of her husband’s, came to her house and said, “Cathy, I need you!” She bought the place herself when her husband died. She said she was going to take a two-week break then decide what to do next. Regulars can find Cathy, former waitress Kim Jurgensen, and each other on their Facebook page, Save the Ohio House Coffee Shop. Ohio House Coffee Shop special: Deuces Wild RIP. I didn’t. Because that wouldn’t have been nice. And one of the rules at diners: Be nice or leave. Pass me the pancake syrup, because I’d like to stay and hear some more stories. Correction: An earlier version of this story misstated the name of the company that Anthony Franks bought his restaurant from. The company&apos;s name is Jerry O&apos;Mahony Inc., "Lunch Car Builders," of Bayonne, N.J.